Organic, on-the-page SEO is our specialty and is included in every Web Pro and Platinum package as well as all Paid Search Ads packages at no extra charge. We’ve been at it for 15 years and have achieved great results for clients. All of our Platinum sites are regularly on Page One of Google for their search terms due to our hard work behind the scenes. Our first example is one of our Platinum sites; you can see they hold the top three organic positions. 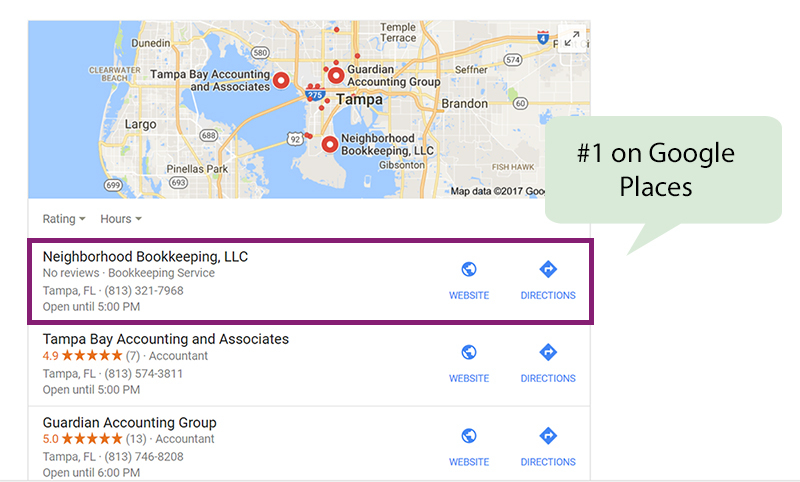 Next you’ll find examples of clients who have landed in the elusive and exciting “Map Pack.” That means their sites have been ranked in the top three of the Google Maps insert on the search results page. This search “real estate” is valuable and gives your business even more exposure to prospects. 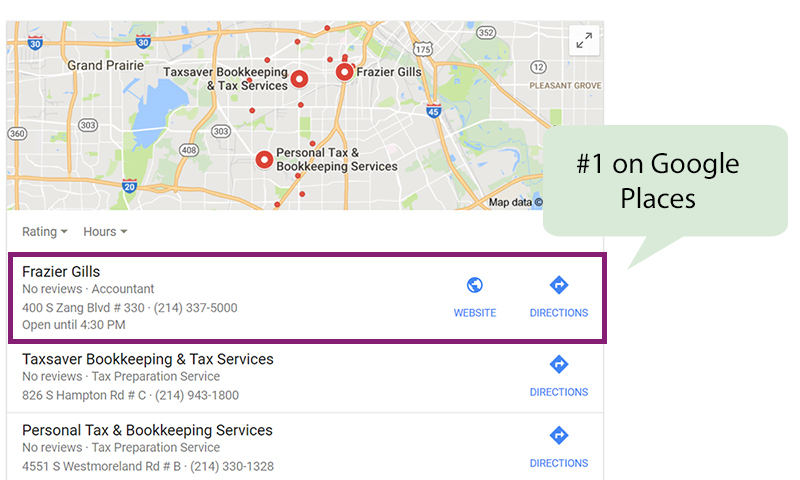 This client has earned the number one search spot via her Intuit QuickBooks ProAdvisor profile and the number two spot via her website. 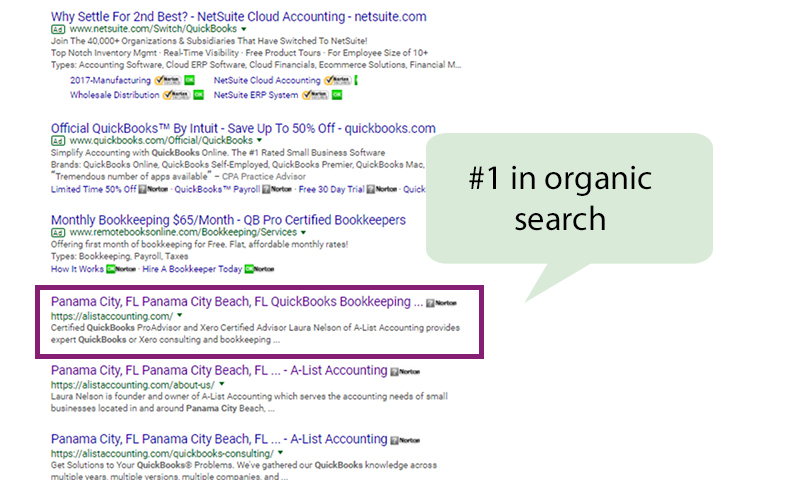 She has also earned the right column by claiming and optimizing her Google for Business listing. 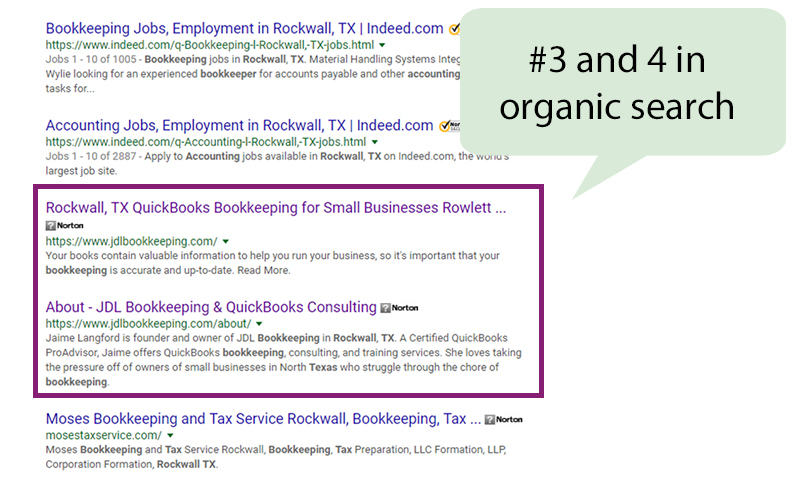 This next client has a relatively new domain and still has earned places number three and four on page one of search, after a job site, not a competitor. 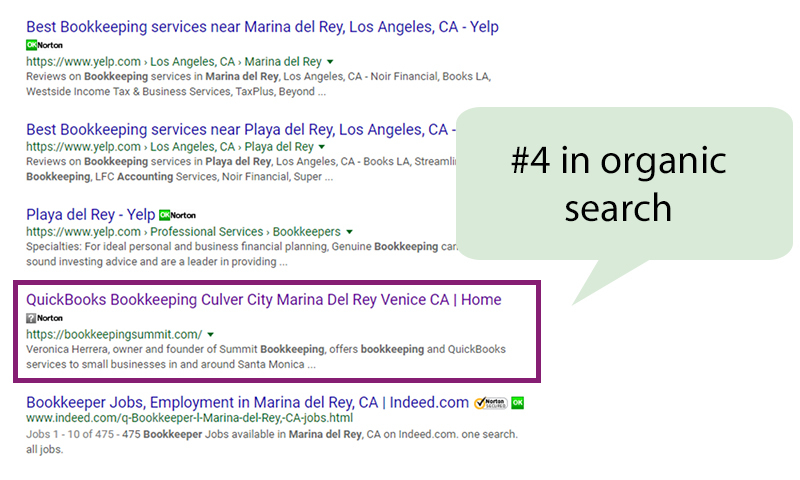 This example shows our client ranking at number four after Yelp takes up the first three places, but ranking before the job site Indeed. 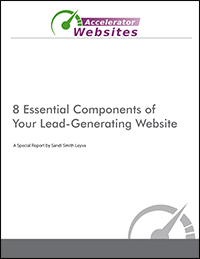 Don’t give in to the emails you’ll get from people promising to place you on Page One. No one can promise that. And don’t pay extra to SEO businesses until you’ve talked with us. We see lots of bad jobs out there (especially with paid ad management) and can at least help to educate you on what’s possible and what’s not. While we can optimize a site we haven’t built, we don’t offer that service anymore. Our web package prices are so low that it makes better sense and is more cost-effective for you to purchase them in lieu of hiring us to optimize your site from the ground up.